Leno is our established number one so obviously he should keep his place tomorrow. He’ll be in for a busy afternoon so hopefully he’ll be on top form! I think we should switch to a back three tomorrow to try and deal with the formidable Man City attack. Koscielny is back in full training after recovering from a jaw injury that kept him out of the win over Cardiff so I’d start him in the middle of the three. Monreal did a decent job in midweek and I think he’d be excellent on the left side of a three-man defence as he’d give us a good balance. With Sokratis and Holding ruled out through injury, the final place would have to go to Mustafi. Let’s pray he has one of his good days. Bellerin is obviously out and Maitland-Niles faces a late test after missing the Cardiff game with a minor knee injury but hopefully he makes it as otherwise we’ll have to choose between Lichtsteiner and Jenkinson. Personally I’d rather see Jenks! I’d like to see Arsenal go with two midfielders in front of the back three to add even more defensive security. Torreira should sit in front of the defence and offer protection while Xhaka should keep his position alongside the Uruguayan. Guendouzi played well on Tuesday night and we might miss his energy but I think we need a bit of attacking threat to go with a back three and two deep midfielders so I’d go with Ramsey in an advanced midfield position. New Customers can get Arsenal at an enhanced 80/1 to beat Man City. Max Stake £1. Winnings paid in free bets. Full T&Cs Apply. 18+|Gamble Aware. 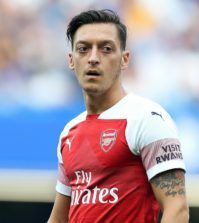 Ozil did okay on his first start for a while but I personally expected a bit more from him at home to Cardiff. I don’t think there’s any chance Emery will start the German at Man City so a place on the bench is the best he can hope for. Emery has said new signing Denis Suarez can play in midfield or on either wing so it will be interesting to see where he’s deployed at Arsenal. There are some fans calling for him to start tomorrow but I think it would be a huge risk to throw him straight in to this kind of game so I’d put him on the bench. 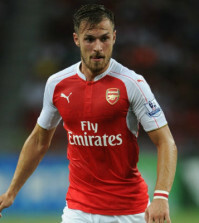 That means Ramsey is the man for the attacking midfield role. I think the Welshman has conducted himself well since it became clear his future is away from Arsenal and he’s still giving his all for the club. Let’s hope for a top display from Rambo tomorrow. 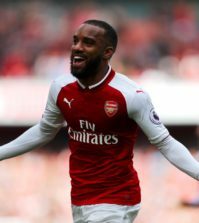 While we need to focus on keeping Man City out at the back, it’s important to try and offer a threat ourselves so I hope Emery starts both Aubameyang and Lacazette up front. We won’t see the majority of possession so we need to use Auba’s pace on the counter and we need Laca’s lethal finishing to convert any chances we do create. Mkhitaryan should be back in the squad as he’s recovered from a foot injury while Iwobi is also pushing for a start so we’ll finally have some attacking options from the bench.